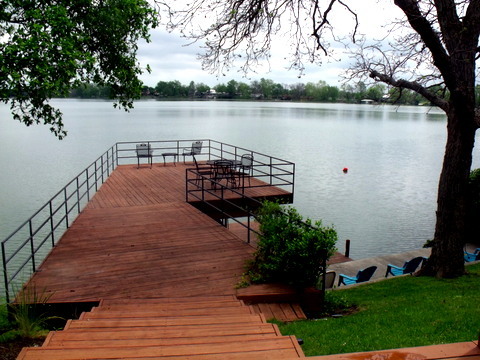 Lake McQueeney real estate is the hot spot of central Texas when searching for waterfront homes. Lake McQueeney originated as a reservoir on the Guadalupe River and soon turned into an exclusive Texas destination and community. It provides hundreds of luxury lake homes geared to the waterfront lifestyle. It provides private access for those residents living in the adjacent, premier Texas lake neighborhoods. Lake McQueeney provides a venue for all sorts of water-related activities that include, boating, swimming and fishing for residents year round. The Lake also provides a central island that includes homes and more luxury lake amenities. Lake McQueeney is located two miles west of Seguin in New Braunfels and McQueeney. The pond area is 400 acres with a storage capacity of 5,050 acre-feet. The lake’s prominent feature is Treasure Island, a residential area reached by a connecting bridge. Most of the lake is approximately 10 feet deep, with deeper sections along the center channel. Private Lake access only. Boating, water skiing, jet skiing and fishing. Lake McQueeney is home to the “Ski-Bees” ski club and is used heavily year-round by water skiers. Lake Breeze Ski Lodge is a private club on the lake. Come be my guest one day! Summertime, and the livin' is easy! Welcome to your island oasis. This amazing property in Treasure Island, on Lake McQueeney, has it all! On almost 2 acres, it beautifully hosts a private volleyball/tennis/basketball court, sparkling pool, outdoor kitchen, wrap-around deck and Lake access! Large master suite w/ outside access has whirlpool bath, separate shower, and his & her vanities. Downstairs is newly finished and would be a great place for an office, workshop, bunk rooms or fitness center or 4th bedroom. Recent improvements to this 75 ft of prime Lake McQueeney waterfront property, includes a boat lift with upper concrete deck and separate jet-ski lift. Home is situated on a gentle sloping bank which provides the perfect unobstructed views from the limestone covered patio or large living room and master bedroom picture windows. This get-away property will be sure to suit your family and friends during every season for years to come! Mid-Century Northeast facing Lake McQueeney waterfront home sitting on over 96 ft of waterfront. Tucked into the highly sought-after Treasure Island you’ll feel the worries and stress melt away as you drive in and over the 2 bridges to relaxation and entertainment. You’ll enjoy the open floor concept, 2 living areas, bonus room, high ceilings and picturesque windows. The updated kitchen includes granite counter-tops, breakfast bar, and stainless appliances. Beautifully landscaped front and backyard makes enjoying the large waterfront patio even easier. The fully fenced yard offers private steps down to the waterfront, covered boat-lift, cement retaining wall, and carport. Minutes to the Ski Lodge by boat! Conveniently located to Seguin and New Braunfels.